Sea Cottage 126 - Diaz Beach, Mossel Bay Accommodation. 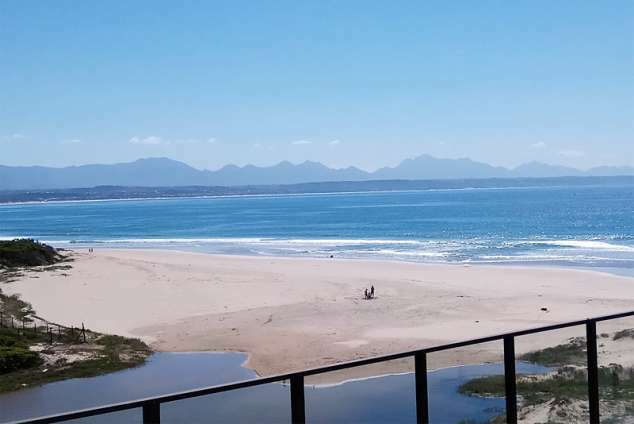 This three bedroom unit is in a security complex on the beachfront of Diaz Beach between Hartenbos and Mosselbay on the Garden Route. It is elevated on a dune barely an arms length from the beach. Beautiful white sand and swimming beach stretches for several km's to both sides. The ground floor has a undercover braai patio with table and chairs, an open plan kitchen and living room with stacker doors that opens up to the patio. You can sit and relax in the comfort of your living room and has a un spoilt sea view from your chair. There is a TV in the living room and a satellite dish. Kindly bring your own DSTV decoder and card. The kitchen is fully equipped and includes a fridge/freezer combination and a chest freezer, gas hob and electric oven and a microwave oven. The kitchen has also a small table with four chairs. There's also a separate scullery with a dishwasher. The front loader washing machine is located in the bathroom. The ground floor has two bedrooms with one having two single beds and the second one a double bed. A cupboard divides the two rooms. There is also a sliding door for separate entrance to this bedroom. The ground floor has a bathroom with a shower, toilet and basin and another separate guest toilet with a toilet and basin. The main bedroom is on the second floor with an en-suite bathroom with shower, toilet and basin. A sliding door opens up to the deck with amazing sea view as far as you can see. Laying on your bed you can even enjoy the spectacular sea view. We supply linen. Please bring your own towels. Parking for two cars is next to the house with one parking being undercover. There is controlled access to and from the beach by means of an electronic security gate. The complex also has controlled access and electric fencing. There is a sparkling swimming pool and a play area for the kids. Diaz Beach is ideally located, only 5 min drive to Hartenbos and 5 min to Mosselbay and 30 min from George. Oudtshoorn with the Cango caves and ostrich farms is only 70km away. Medical facilities is within 5 km's. An indoor warm swimming pool, super tube, cocktail bar and restaurant is walking distance from the unit. The casino, golf course and various restaurants is within 10 km range. Bring your bicycle and enjoy the gravel farm roads or jog for km's along the beach. In peak season there are various activities on the sea like parasailing, boat cruises to Rob island, live entertainment and many more. Unfortunately no pets allowed on site and no smoking allowed in the house. 5286 page views since 24 Oct, 2017.